Nespresso – An Unsustainable Business Model? Single-serving coffee made at home. That’s the category Nespresso operates in – a segment estimated to be 8 billion USD in 2012 (source). It took 30 years for Nespresso to get to where it is now. Their first patent was registered in 1976 and it was launched internationally in 1991. As of 2012, their concept (machine, capsule, service) is subject to 1,700 patents. Features celebrities, such as George Clooney and John Malkovich, as brand ambassadors. At 55 cents for a 4-g capsule, Nespresso coffee works out to a nerve-jangling $62 per lb. ($137 per kg). And the hefty markup doesn’t seem to bother its fans. Is rumored to command gross margins at about 85%, compared with 40% to 50% for regular drip-coffee brands. The company confirmed that Nespresso is targeting to grow sales by around half a billion francs in 2013. As a brand, Nespresso has been vaunted as the “Apple of coffee pods” riding high on the classic razor/razor-blade business model – otherwise called as the Vendor Lock In business model. See an informative video here on the specifics of the Nespresso business model using the framework of Business Model Canvas. Mondelez International, the world’s second-biggest coffee maker, is going head to head with larger rival Nestle by launching capsules compatible with its Nespresso system to steal a share of the premium coffee market. The capsules will be sold under the Jacobs and Carte Noire brands in many EU markets in the second half of 2013 – the biggest challenge yet for the $4.4 billion (2.8 billion pounds) Nespresso brand that has sued many copycats. These are just the warning bells for the company as many more brands jump onto the bandwagon of this fast growing coffee segment. Benefit from market growth: Even if Nespresso’s share drops, sales can still increase if the market is growing. Keep product quality up: Continue offering a better coffee experience through its select blend of coffee. “Load” existing customers: Defend against the Mondelez launch by loading its existing customers with product, and so taking them out of the market. Drive distribution: Drive distribution in new channels. e.g., store-within-store formats. I would however beg to disagree here, as I suspect if the current business model can be sustainable in the long term. And my argument is equally applicable to the Tassimo’s, Dolce Gusto’s, Keurig’s and Verismo’s of the world. Why? Insight #1: Which business are the Nespresso’s of the world actually into? ..while pod machines might not make great coffee, they do make a consistent cup. This is making them irresistible to high-end restaurants…. Nespresso machines can now be found in the kitchens of around 30% of the world’s 2,400 Michelin-starred restaurants. The appeal is obvious –they’re consistent, cheaper than hiring a barista and take up less space than a traditional espresso machine. 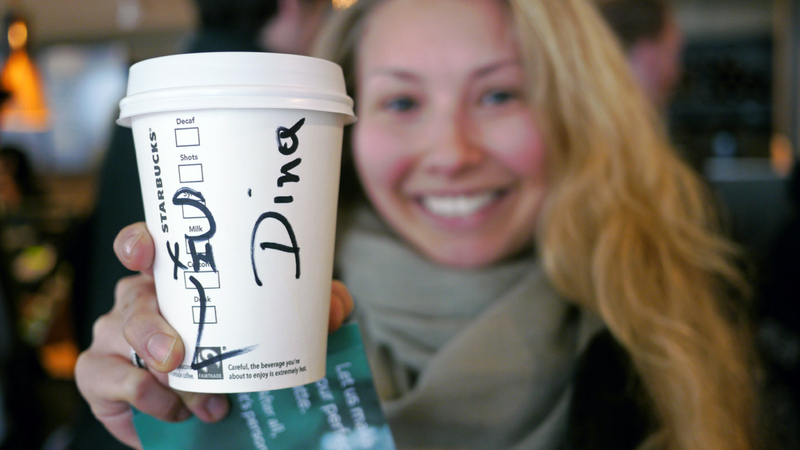 Insight #2: What can I learn from a cup of Starbucks coffee that bears my name? What if a ‘coffee pod’ sets up a unique proposition of designing a one of its kind, exclusive and a truly unique coffee blend concocted to your minutest specifications and delivered it to you as your own coffee pod (like that cup of starbucks with your name on it) for you to be able to enjoy this very same cup of coffee day after day using the machine back home? The benefits are obvious: enduring consumer relationships, deeper consumer insights, a treasure trove of data on how people love their coffee, a truly unique blend that only you can deliver, resulting in pods that consumers are willing to pay a premium for and finally pods that cannot be easily replicated by the “me too’s” of the world. Speak about infusing authenticity to the vendor lock in business model. This entry was posted in Business Model, Business Strategy, Innovation, Retail and tagged Business Model, Coffee, Coffee Pod, Dolce Gusto, IKEA Effect, Keurig, Mondelez, Nespresso, Starbucks, Tassimo, Verismo. Bookmark the permalink. Wow – That is truly a neat concept. Do you know if Nespresso or any other vendor is working on something like this ? That was a wonder article. When we consider our five senses, marketing has been done considering mostly in all the senses. But I was wondering whether there are any marketing strategies going on for the sense of touch? Are there any brands which we can recognize just with the touch?